This Decora SideLite Night Lite by LimeLite allows you to add an electroluminescent night light without sacrificing your existing single outlet. 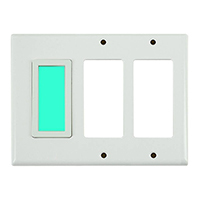 This direct wire night light will replace a double-gang electrical Decora style outlet or switch plate cover, with a double gang outlet cover with an electroluminescent green light to one side. It is one of the most energy efficient night lights out in the market. Because the power consumption is so low, it never gets hot, making it child safe.